We carry a large selection of Kawasaki Mule Accessories at CyclePartsNation. To help us serve you better, please select your vehicle year. From your selection, we'll match products that fit. 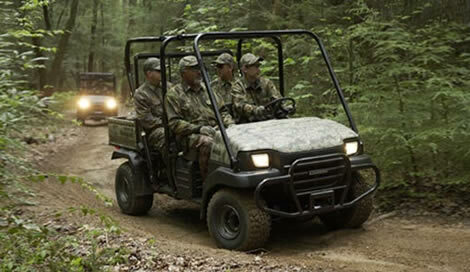 Able to switch between two-seat cargo hauler and four-seat people mover in a few quick steps, the Kawasaki Mule™ 4010 Trans4x4® utility vehicle is a genuine two-for-one bargain. Between government implementation, farming and ranching and extensive use in underground mines, we've seen it all. If you're in need of a Kawasaki Mule, Mule Parts, or Kawasaki Mule Accessories.